Event – Multi Family Yard Sale! 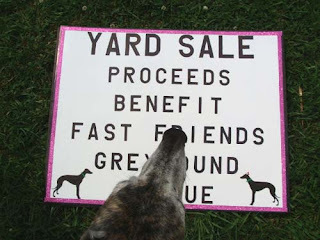 Get ready for a “REALLY BIG” yard sale! Our volunteers have been collecting items for several weeks and we have to say that we now have enough to call this yard sale extraordinary! We have all been filling a large hauling trailer to the brim! And we are still collecting more! Adamstown, Maryland. The yard sale will run from 9 a.m. until 5 p.m. on Saturday, August 13. This is a major fund raiser for our group. It will also be a chance for people and hounds to get together. Jo and CL have a beautifully landscaped yard (nearly three acres of level grass!) that hounds will LOVE! We will have a number of x-pens and resting places under trees for all hounds that wish to come along with their adopters while the sale is going on. Jo and CL live along a major route in Maryland and lots of traffic will be available to lure in to buy, buy, buy.